* Weight Capacity: 50 lbs. (22.5 kg). 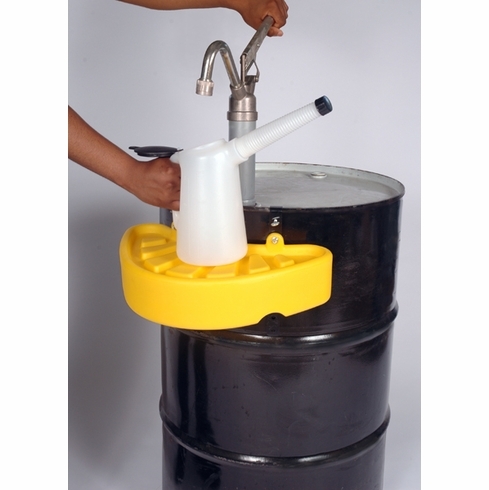 • Polyethylene Shelf attaches to the side of drums — supports containers while being filled from drum pumps. • Adjustable brackets allow user to position fluid dispensing containers closer to drum pumps. • Fits 30- and 55-gallon steel drums and most 55-gallon poly drums. • Catches minor spillage; secure ribbed top holds up to 32 ounces of nuisance drips. • Powder-coated steel strap brackets attach securely to drum chime with thumb screws. • Easy to clean; resists chemicals and will not rust, dent or corrode. • Not for use with flammables.